Over the past weekend the Lonewolf GT was held in Fort Worth, Texas attracting nearly 90 players. It can legitimately be called the largest Kings of War tournament in the world and attracts players from over the USA plus a number of Brits. The headline results have been released and I thought that I would have a look at the top armies in terms of Battle and compare them to what we saw last year. 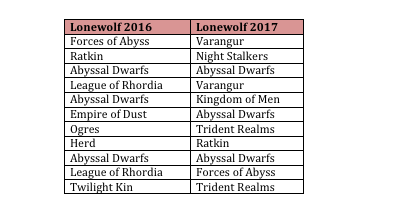 Lonewolf is a nice dataset as it is big enough to have pretty much all the armies represented plus the presence of a significant cadre of KOW expertise. I'm not interested in the average performance of an army as the sample is statistical too small. However I think you can get some very good insights at what performed at the pointy end of the table. Above is a table showing the Top 11 armies for Battle (in order) for both Lonewolf 2016 and 2017. In both cases it is 11 as what would have been 10th Place produced a tie. One point worth noting is that five players guiding a Top 11 army in 2016 are back in the Top 11 2017 - however only one is running the same army. My initial thoughts when I saw the 2017 results was that there had been a concentration. However while true, it is only minor - 8 different armies in 2016, 7 different armies in 2017. This doesn't look at the make-up of the list of course, rather the toolkit at the player's disposal. Nor does it look at any path to the Top 11, either opponent or opponent/scenario. There does seem to be at least a hint of an elephant in the room. Both years Abyssal Dwarfs have been the best represented at the top end of Battle scores.Yes, I'm sure there are instances where they didn't perform but I think that there is enough evidence over the two years to say that "in the hands of a good player, the list can consistently put you at the top tables". There may be mitigating circumstances but I do think that based on Lonewolf 2016/17 it is worth at least a conversation when the Rules Committee next discusses Army Balance. It may be nothing but the Lonewolf data may also be giving a signal. What is heartening is that a number of the RC were at the event, and at least one used Abyssal Dwarfs. I'd be interested in there thoughts. Top battle went to a Dwarf army in 2016 (Marc Tailor), he was numerically second, but they don't give multiple awards, so best general sometimes goes to the second person if the top person (Jeff Swan) is getting the over all award. Given that Marc's paint score was absolutely dreadful, he wouldn't rank highly overall. Assuming you were doing this manually, you didn't know that you needed to scroll all the way down to 41st to find the second highest battle points. Thanks. Yes, I did miss that. I didn't scroll down to 41st. Wow, that army must have an "interesting" paintjob.